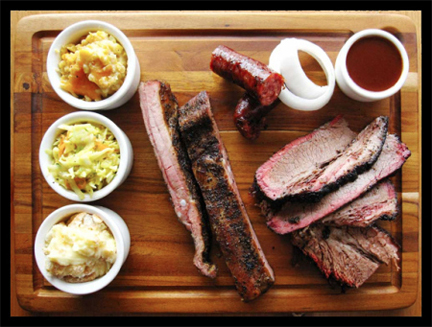 Above: Barbecue from Stiles Switch in Austin. Image via Fed Man Walking, a blog authored by former Austin American-Statesman folklore and food columnist Mike Sutter. Click here for his review of the restaurant. When I first moved to Austin at the end of 2008, there really weren’t a lot of great bbq options in town. You had to drive out to Driftwood (Salt Lick), down to Lockhart (Kreutz et alia), or up to Llano (the original Cooper’s) for the real deal (although Sam’s on East 12th was always good in a pinch). Then, in 2011, the Austin bbq war happened. A number of new and highly competitive places opened, including the highly praised Franklin’s. The not-so-collegial conflict was punctuated by thieves stealing raw brisket from the local supermarket chain H-E-B by stuffing them in their pants. Although Franklin’s remains the darling of the national media, Stiles Switch (on the north side of town) emerged as one of the winners of the conflagration and was recently voted one of the top 50 bbq destinations in Texas by Texas Monthly. Tomorrow afternoon, Vino Vino will also be hosting its annual rosé wine festival, Pink Fest, one of the best wine events in town. I’ll be at both happenings. Come out and taste with me if you’re in town! Buon weekend e buona lettura, yall! Tracie P and I are always trying to come up with ways to include more and more vegetables in Georgia P’s diet. The number-one strategy is to incorporate them in dishes she already likes (pasta, quesadillas, etc.). For her dinner last night, I sautéed diced, unpeeled green zucchine in butter with a garlic clove and pinch of kosher salt. After deglazing with white wine and allowing the alcohol to evaporate, I added a finger of chicken stock and simmered for about 5 minutes. I strained the zucchine and then finely chopped until I achieved a light paste. Then I assembled the sandwich on whole wheat bread, with a delicate schmear of mayonnaise, two slices of white cheddar cheese, and an even spread of the zucchine paste. I fired the sandwich in our cast iron skilled, greased with extra-virgin olive oil, over high heat. Georgia P was SO excited when I served it to her. I think it’s safe to say that it was the best and most gooey grilled cheese sandwich she’s ever had. The photo above comes from the Facebook of my friend Giovanni Contrada (left), born in 1957 and raised in Boston by his mother (right) a seamstress from Naples whose first language was Neapolitan. That’s a bottle of “Fernet” on the counter and the setting is breakfast before getting off to school. 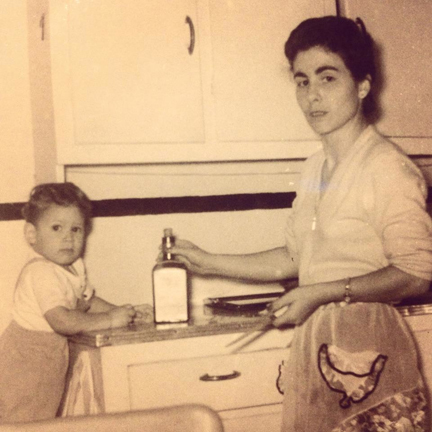 “My mother used to give me an espresso with a raw egg yolk [folded in] and a shot of Fernet,” Giovanni remembers. By the time Giovanni was school-going age, there were literally scores of Fernet Branca imitators and counterfeiters. As late as the mid-2000s, if you visited the food shops that dotted 18th Ave. in Bensonhurst (Brooklyn), you’d still find a few of the labels on the shelves. I remember seeing some at Trunzo when I lived in Brooklyn and shopped there frequently. In Italy to this day, Fernet Branca and the many popular amaro and “Fernet” brands are considered and consumed as tonics. And in an era before a Duane-Reade on every corner and a pill for every malady, amaro and Fernet in particular were employed and applied as cure-alls — and not just for indigestion. Giovanni’s photo and remembrance are examples of how Italian migrants brought this tradition with them. And many of Italian-American friends in their mid-50s have similar recollections of Fernet as a tonic given to them by their parents. Americans’ attitudes about Fernet and amaro began to change in the 1970s when Fratelli Branca began to reposition the Fernet Branca brand as a recreational drink. That all went away in the 1980s when the FDA noticed that Branca was still importing the brand using a medicinal license, a bureaucratic nugget that dated back to the Prohibition era when the brand was openly sold as a tonic in Italian neighborhoods in the U.S. Jägermeister ultimately took its place. Giovanni’s mother passed away last year. I can’t imagine that she would recognize the Fernet of her youth in the festishization of amaro that has emerged here in the U.S.
I’ve really been enjoying Levi Dalton’s excellent series of posts “On the Amaro Hunt in Italy.” And it’s been exciting to watch brands like Nonino become so popular among the legions of mixologists who use amaro as an ingredient in their ars miscendi spiritus destillatos. Off topic, Giovanni is the stylist behind the Imp of the Perverse, a fashion line you’ll find on the racks of upscale retailers like Fred Segal in West Hollywood. He regularly posts images of his new work and the many celebrities who sport his jackets via his Twitter. 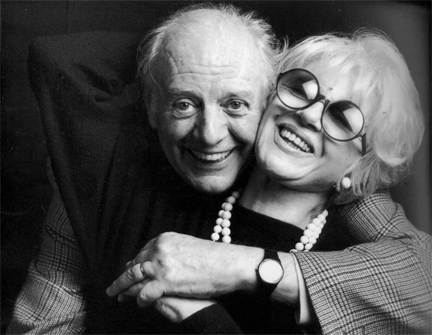 Above: Activist, writer, and actor Franca Rame (right) with husband Dario Fo. Image via Eclap. One of the most thrilling moments of my university years in Italy was seeing Franca Rame perform and meeting her and Dario Fo in Rome. They were in the lobby of the theater before the show and very graciously gave their autographs to a starstruck American student. Here’s her obit in the Guardian. Above: Four of six bottles of Dettori 2010 Romangia Bianco have been fizzy and slightly sweet. Dettori Romangia Bianco, a skin-contact wine from Sardinia made from 100% Vermentino grapes, is one of our all-time favorite wines. Tracie P and I have a mini-vertical of the wine in our cellar and we buy a case of every new vintage to put down each year. That’s just one of the reasons that I was so thrilled to see the wine finally make it to the Texas market (until now, I’ve bought the wine in California where I keep my cellar). But the number-one reason was that we love drinking it. Above: The Dettori back label with a note on the winery’s approach to vinfication. Click image for high-resolution version. I can’t imagine that anyone, even the greatest Natural wine skeptic or detractor, would deny that Dettori’s wines are Natural wines. 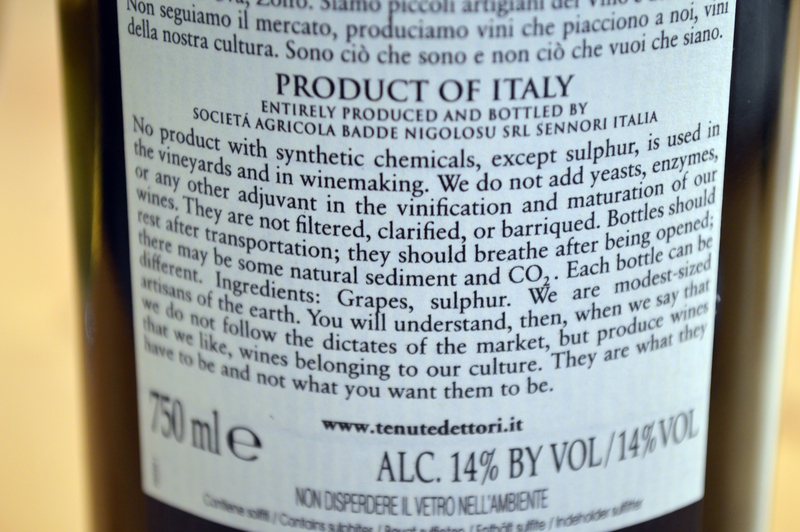 As Alessandro Dettori writes on the back of each bottle, the only ingredients are grapes and sulfur. 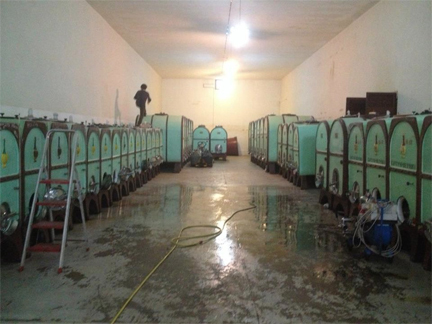 And no enzymes or additives (he calls them adjuvants) are used in vinification. 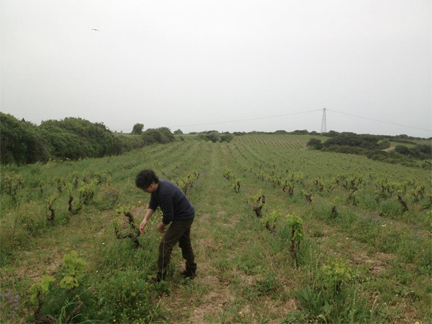 In my experience, the wines can be radically different from vintage to vintage. But their intense tannic component seems to keep the wines relatively stable although never homogenous. Above: Alessandro Dettori in his “oldest vineyard.” I’ve never been to the winery but my friend Georgios Hadjistylianou graciously let me use these photos from his recent visit there. Here’s the photo album. Thanks again Georgios! I won’t conceal my disappointment when four (so far) of six bottles turned out to be fizzy and slightly sweet. When the importer came through town and tasted the wine with me earlier this month, the 2010 seemed to align with my previous experience. It was tannic and rich, very youthful in its evolution. I couldn’t wait to buy some. And when my local wine merchant told me he was holding the last six bottles for me, I hurried to the shop to pick them up. But I’m sad to report that somewhere along the way — probably due to the extreme and often capricious Texas heat — the wine underwent a secondary fermentation in bottle. Above: Cement vats at Dettori. As Tracie P noted, they taste like vino paesano, the “country wine” that is often sold in demijohns in proletarian Italian wine shops. 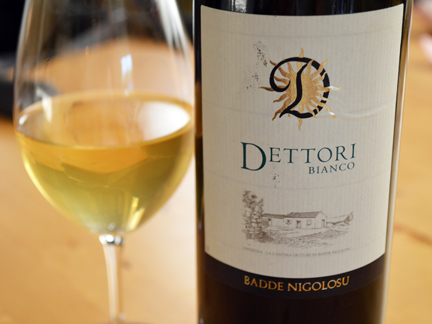 It’s fresh and bright, the alcohol and tannin are tame, the acidity is zinging, and the gentle spritz makes it even more food-friendly. I’m a wine professional and am well aware that a flawed or corked bottle here and there are variables in the vinous equation. But four out of six bottles and counting could be grounds to ask for my money back. But, no, I would never do that. I’m a Natural wine addict and if nature — including the moody temperatures of my adoptive state — has delivered the wine in this condition, it’s my bitter sweet pill to swallow. We’ve been drinking the flawed but wholesome wine as an apertif and pairing it with early summer pesto and pasta al pomodoro. Not as cheap as a vino paesano but equally enjoyable. 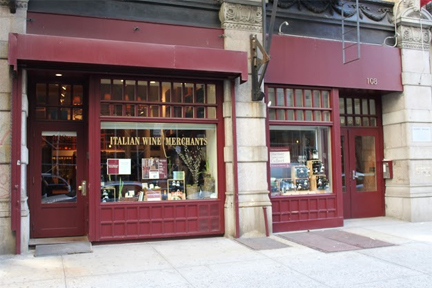 Esposito’s Italian Wine Merchants on 16th St. in Manhattan. Image via Google Places. 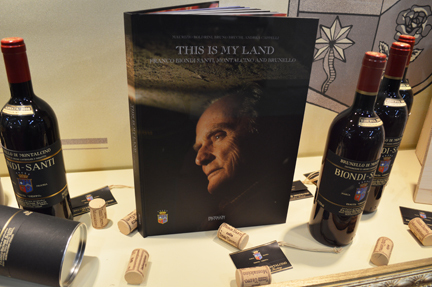 According to a press release issued last week by PRWeb, Italian wine merchant Sergio Esposito has purchased the Biondi-Santi library for $5 million. The “7,000-bottle” archive stretches back to 1945. A wine industry observer, who spoke to Esposito about the acquisition, told me that the winery’s owner Jacopo Biondi-Santi was facing financial pressures in the wake of business investments gone awry. Jacopo is the son of Brunello patriarch and patrician Franco Biondi-Santi, who died less than two months ago at age 91. The sale of the wine is significant because it is “the largest vertical collection sale in history of ‘blue chip’ Italian wines.” It also represents Esposito’s latest move in his quest to amass a behemoth-sized collection of investment-worthy Italian wines. Above: Brunello patriarch and patrician Franco Biondi-Santi died in early April 2013. I worked as the media director at Esposito’s Italian Wine Merchants in Manhattan when it was still co-owned by celebrity chef Mario Batali and celebrity restaurateur Joe Bastianich, who pulled no punches in his brutal account of their business dealings. In my view of the Italian wine world, the acquisition marks yet another milestone in the big-businessization of Italian wine. In the New Testament “Parable of the Talents,” the master praises his servants for investing well. 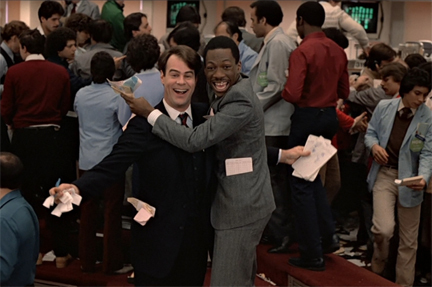 No one can fault Esposito and his group of investment bankers for wanting to augment their business and increase their earnings. But the moment a bottle of wine — the fruit of the vine — becomes a “blue chip,” it ceases to be an expression of a place and of the persons who tended that vine. It’s no longer the child of tradition and culture but a mere object to be traded among the world’s elite. It’s the ultimate reification of agriculture. And the moment that we forget where that bottle comes from, we lose sight of the humanity that produced it. In that estrangement, we lose sight of ourselves. 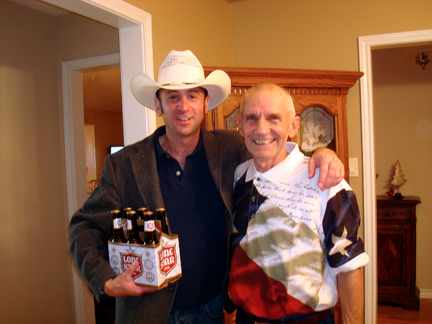 Above: Melvin (above, right) taught me a lot about what it means to be a Texan. Especially when I revisit the North American coasts where I used to reside, friends often ask me, so how do you like living in Texas? When I tell them that I love living here, they sometimes respond with skepticism. But you live in Austin! I love Austin. But that’s not really Texas. To that, I answer quoting my cousin Jonathan Levy, a professor at Princeton and a native Houstonian. Politeness, dignity, consideration, and humanity in personal interaction? Texan. My goodness! Tracie P and I have almost four cases of wine stacked up in our samples corner! That’s not a bad thing: I’m always game to taste wines I’m unfamiliar with and always geeked to taste new vintages of wines that I know and follow. Luckily for us, the Texas summer is already here and it’s too hot to ship wine. And we have plenty of bottles that I need to sort through and taste in coming months. 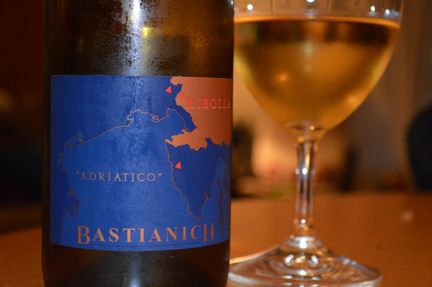 The other night we opened the Bastianich Adriatico Ribolla, sent to us by my friend Wayne who works as the Bastianich “special ops” man in Friuli. Now that we’re rolling into the last few months of our second pregnancy, I’ve begun cooking dinner nearly every night so that Tracie P can rest at the end of her day. 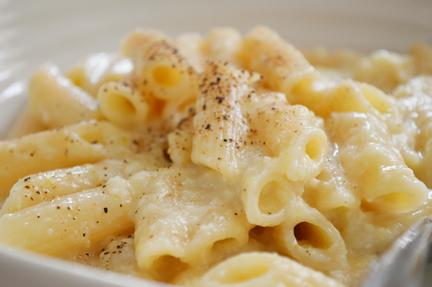 The star of last night’s dinner was penne with white asparagus (above). I peeled, trimmed, washed, and steamed a bunch of beautiful white asparagus until tender and then puréed the stalks and tips with about a quarter cup of white wine (I added the wine while the asparagus was still piping hot so that the alcohol would evaporate). Then I folded in some freshly grated Parmigiano Reggiano and an eighth of a cup of milk. Before folding in the Rustichella d’Abruzzo (our house brand) penne, I added some of the pasta’s cooking water to the purée. 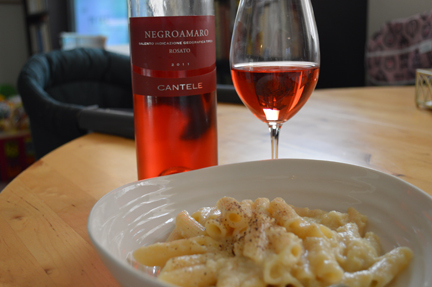 Tracie P (who has a glass of wine a couple nights a week) and I paired with one of our all-time favorite Apulian wines, our good friend and client Paolo Cantele’s 2011 Rosato from Negroamaro. The wine had actually been open since the night before but hadn’t lost any of its freshness or zing. And its balance of delicate tannin and fruit was a superb complement the sweet asparagus and salty Parmgiano Reggiano. If I do say so myself, it couldn’t have been a better pairing. Paolo and became fast friends back in 2009 when we first met and I’ve been giving him and his family a hand with their English-language media for about two years now. This year, we launched a new blog devoted to their presence in the U.S. market, CanteleUSA.com. Check out my post today for their blog on “Why Italians drink more rosé than you’d think”. We’re almost there… just another seven weeks or so to go until Baby P 2013 comes into this world. 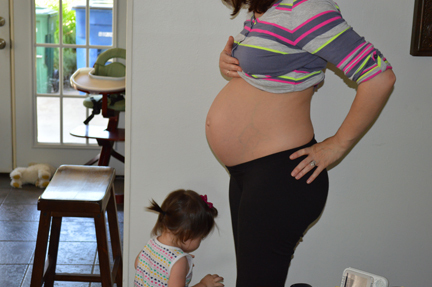 She’s been so active in Tracie P’s belly that sometimes we feel like she’s already here! I’m certainly not the one who does the heavy lifting at our house these days: Tracie P is such a great mother and a mother-to-be (again), diligently regulating her diet so that she can maximize nutrition in these last months when it becomes challenging for expecting mothers to consume all the calories she needs. In seven weeks or so, the world is going to change for little Georgia P, now seventeen months old. 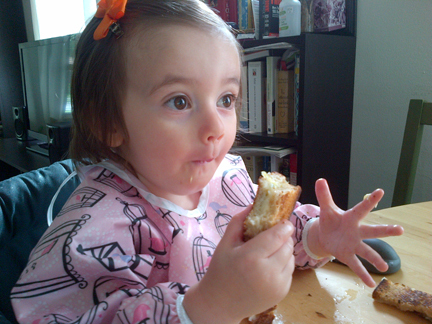 She really doesn’t know what’s about to happen but she loves to kiss and blow raspberries on her mommy’s pancione. After my trip to NYC a few weeks ago, I’m officially grounded for the duration and it’s been wonderful to take over more of the shopping and cooking duties (and it’s SO great not to have to travel). We’re so excited for Georgia P to have a little sister but we’ve also been enjoying these last months as a family of three, with our lives centered on a precious, beautiful, sweet little girl, who’s always ready to share a kiss, a hug, and a smile.